The Movie "A Million Miles Away". Free Movies Cinema has lots of free movies and a handful of TV shows that you can stream at no cost and without creating an account. Below is my review of Free Movies Cinema, where I talk about its high-quality videos, advertisements, and more. All of Free Movies Cinema's movies are categorized in easy to access genre sections at the top of the page via the ALL MOVIES > Channels menu, such as Drama, Horror, War, Documentary, Animation, Comedy, Fantasy, Action, and Western. 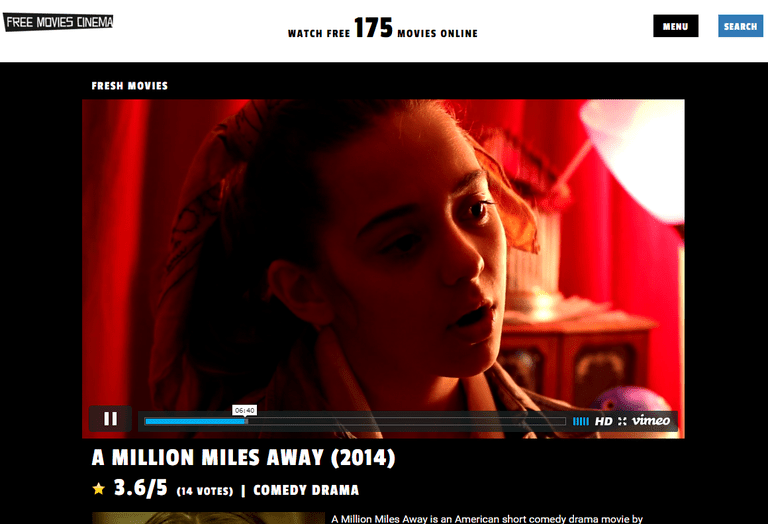 Another way to find some of the best free online movies at Movies Cinema is via the Popular page. There's a link for that at the very bottom of the website. Video quality varies from movie to movie, but I was impressed with several of the films because they displayed in a quality as high as 1080p and looked great in full-screen mode. Most other movie streaming websites don't offer free movies at such high a quality as Free Movies Cinema, so it's great that some are available here. Free Movies Cinema gets movies from various sources, which means the embedded video player isn't the same for every movie you can watch. All the movies, though, are able to open in full-screen mode for better viewing, which is a nice feature. Though some of the movies can also display subtitles, which is a feature found in only a few other movie streaming sites, such as Sony Crackle. Also, some films will let you alter the quality, but again, this doesn't apply to every single movie on the website. Just below the video player are some stats and controls. For example, you can see how many people have viewed that video and what it's current up-vote and down-vote numbers are (you can give it a thumbs up/down, too). You can also share the video over a number of social media sites. It seems odd to not find any in-video advertisements, especially on a free website like Free Movies Cinema, but that's precisely what I've experienced. I watched 10 movies and didn't find commercials in any of them. This is a big difference from other movie streaming websites that have advertisements littered throughout each and every video, so it's a large plus to find zero on Free Movies Cinema. Compared to similar movie streaming websites, many of the films I tested at Free Movies Cinema seemed to take a little longer to resume once I fast-forwarded through the video, but it really wasn't a huge delay, and therefore shouldn't be looked at negatively. I mention this fact because if you're on a slow network or have a slow computer, buffering issues are normally enhanced and can cause serious frustration when watching movies. Though for the majority of people, I think if a little time is given to start up or skip through a video, it will play out nicely. Many free movie streaming websites have an application that lets you watch their films on the go, such as Viewster, Yidio, SnagFilms,and Popcornflix. Free Movies Cinema, though, unfortunately, does not have such capabilities. It may be possible to watch the films from Free Movies Cinema on a mobile device by accessing the regular desktop version of the website from a phone or tablet, but the viewing experience is normally strange because it's not optimized for mobile viewing. I tested the desktop version of the website on my own phone, and while the videos hosted from YouTube displayed normally, browsing through the site wasn't very easy. Aside from the possible buffering problems you may encounter, and the fact the there is no mobile app, I still think Free Movies Cinema is a nice source for free movies. There are plenty of popular genres, you don't have to login to watch the videos, many of the films are in high definition, and there are virtually no advertisements in the videos. What more could you ask for?